Welcome to Day 2 of the Handmade Holidays Blog Hop! Lots of designers and manufacturers have come together to share great ideas for holiday gifts and décor. Be sure to hop through all the blogs on the list at the bottom of this post – and enter to win a huge prize package full of crafty swag! 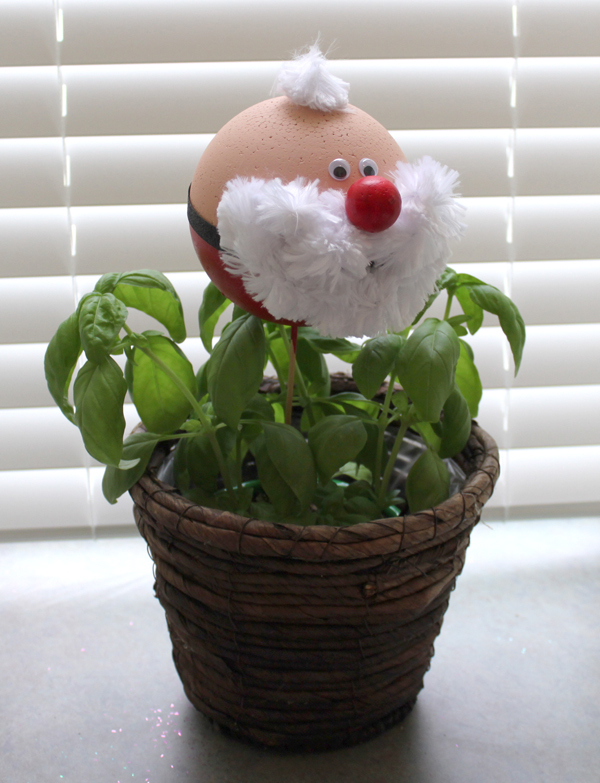 This “peek-a-boo” Santa is great to use on a plant stake, or tuck him into wreath or between the branches of the Christmas tree. ‘Tis the Santa season for many of us and he is popping up everywhere! Where will we find him at your house, I wonder…? 1. 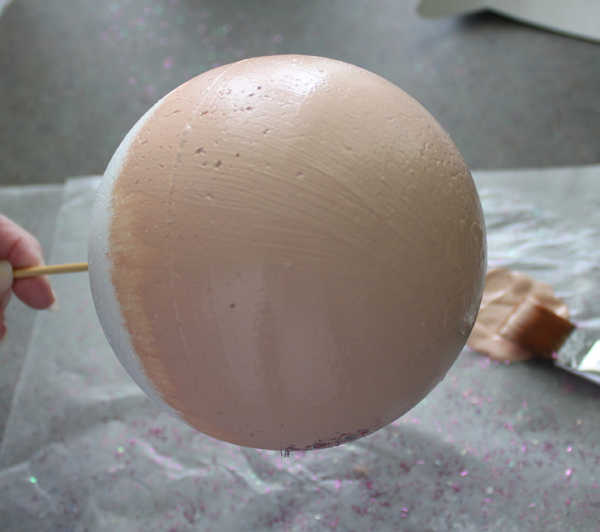 Push a bamboo skewer into the small hole in the 6″ ball to use as a handle while you paint the top half of the ball beige for Santa’s head and paint the bottom half red for his body. Use the seam around the center of the ball as your guide. TIP: Smoothfoam requires no prep and its smooth surface makes it easy to paint. Red paint is often transparent however, so 2 or 3 coats may be required. Let paint dry thoroughly between coats. Dry with a hair dryer if you’re in a hurry! 2. Wrap black ribbon around the center of the ball. Overlap the ends then secure with a straight pin. 3. To make Santa’s nose, push the 1” ball onto a toothpick and paint it red. Let dry, then push the opposite end of the toothpick into Santa’s head above the belt. Glue the wiggle eyes in place above the nose. 4. Bend a 6” length of jumbo chenille into the shape of a mustache and attach it beneath the nose with a straight pin. Use a skewer to make pilot holes on either side of the head, then push one end of a 9”-12” length of chenille into each hole to bend into a beard as shown. Add one more tuft of chenille to the top of Santa’s head to finish. Push Santa on to a skewer to use as a plant stake. Option: If you want Santa to be freestanding, carefully cut a 3” ball in half, then paint one half black. 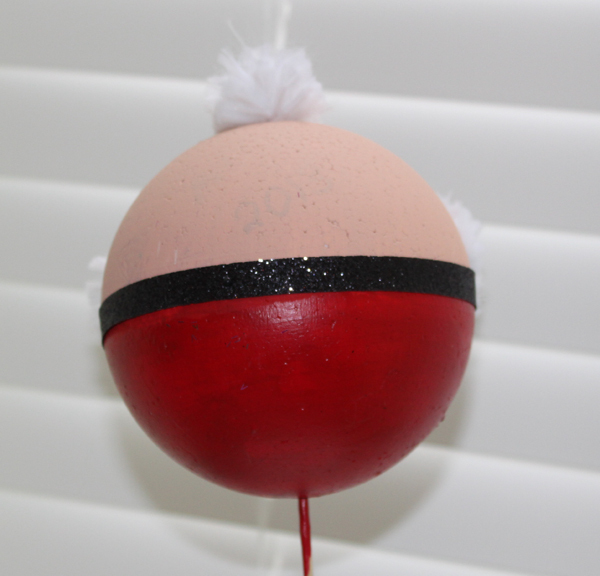 Secure the painted half to the base of the Santa ball with a toothpick. TIP: To smooth out the cut side of the ball, wrap it with wax paper, secure a skewer pushed into the top (rounded part), then carefully go over the cut surface with an iron on medium heat. 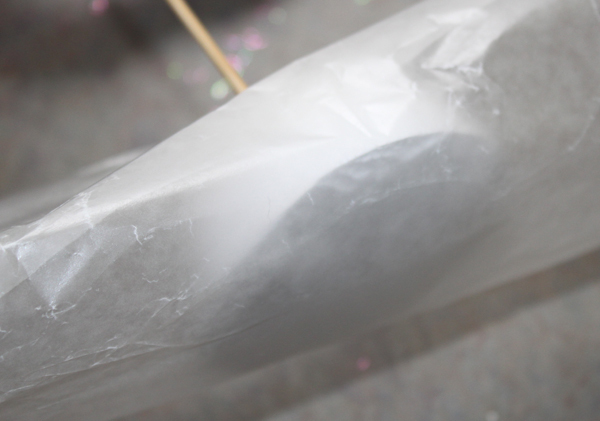 The wax paper will prevent the foam from sticking to your iron. 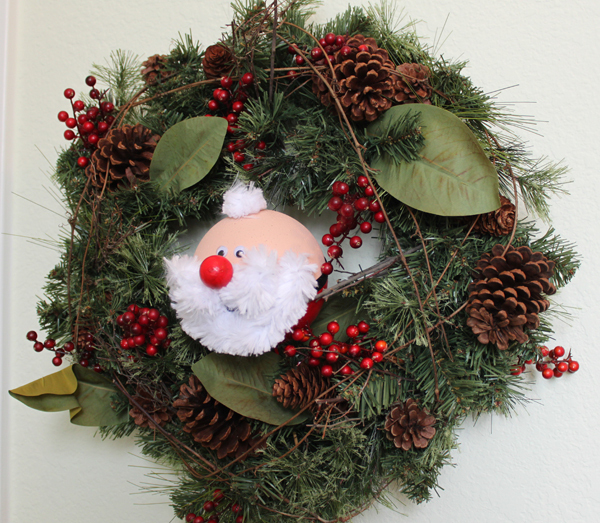 This entry was posted in Holiday Crafts and tagged Ball, Christmas, Red, Wreaths by Julie McGuffee. Bookmark the permalink. Originally from England, I have been professionally involved in the arts & crafts industry for over 20 years as a TV host & presenter, award winning designer, product developer, consultant and author of over 50 "how to" craft books. I love crafts! super fun and easy Santa! So cute. Love the tutorial. That little Santa is adorable! Thanks for this wonderful project. My son would love to make this one. Too cute! And an easy project too, thanks for sharing! Such cute projects. Thank you. So cute! And looks easy, too! I love Santa! He would be a great addition to my Christmas tree! What a cutie patootie Santa!!! !~ Very adorable idea! This is so cute! I never thought to paint foam balls as Santas. This is adorable! What a jolly good Santa!! He is sure to brighten up anyone’s day! Love how easy he is to make! Great craft for the kids also! TFS! The santa is just adorable. Thank you for showing us..the how to. I’d love to make one. Oh my goodness thats all sorts of cute! I love Christmas and everything to do with Santa. I will definitely be using this idea for my decorations. Love the wreath. Don’t have any plants inside so I’ll have to find some place else for that Santa. This santa is soooo cute! 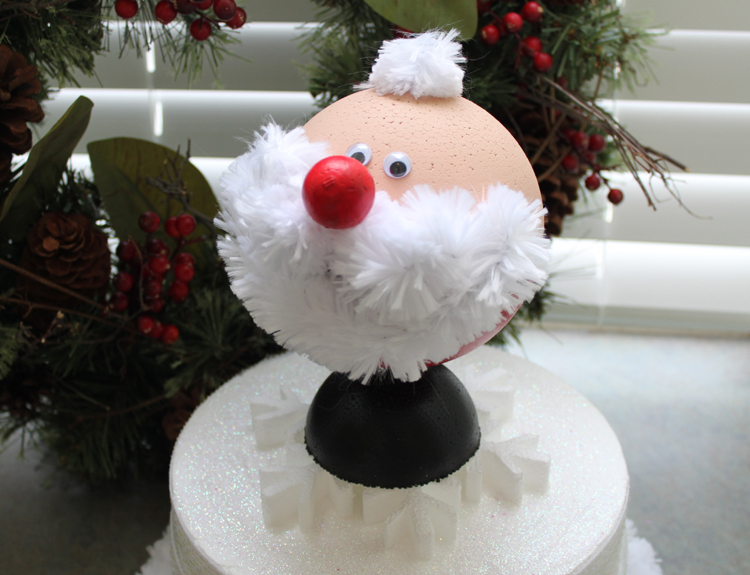 So many great tips here on how to make a cute Santa for the holidays! You make it look so easy too. Thanks for the darling tutorial. Cute ornament! Love the idea of painting on the foam ball! I see peek a boo Santa showing up in a lot of places this year! Awwww…..He’s adorable. Makes me smile just looking at him. Thanks for sharing the sweet project!